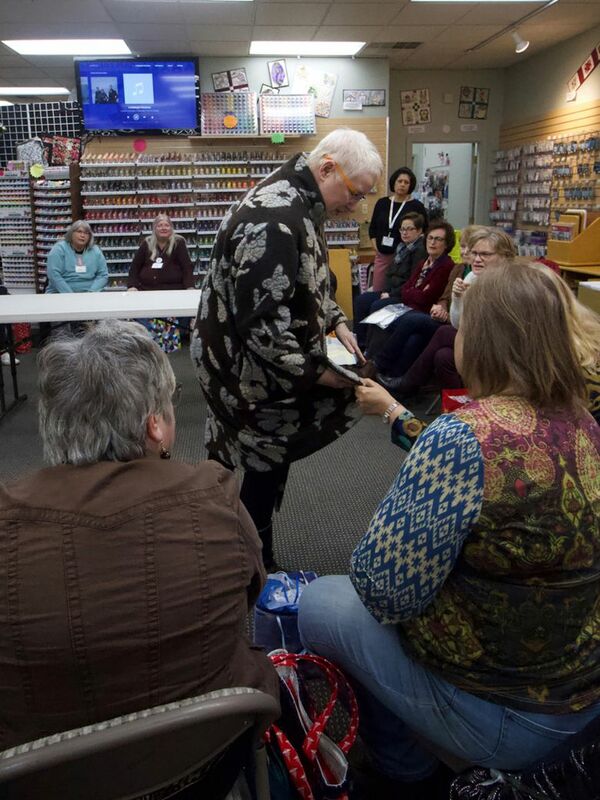 ON A DECEMBER night at Quality Sewing & Vacuum in Bellevue, about 20 women are seated on folding chairs arranged in a circle. In the center is a table filled with brightly wrapped packages. There’s a sense of anticipation as the women wait to dive into the annual mystery-fabric exchange. Every participant brings a certain amount of any kind of fabric, wrapped in gift paper. Then, white-elephant-game style, each chooses a “gift.” Everyone has to make something out of that fabric and bring the item back in three months. Bursts of laughter erupt as each woman pulls out her fabric — a nubby bright-green here, a filmy polka-dot there — and holds it aloft for inspection. Almost everyone ends up with something she never would have chosen for herself. But they always make it work somehow, Maris Olsen says as she looks on. “It was very surprising to see what people did” last year, says Olsen, president of the American Sewing Guild’s Greater Seattle chapter. Sewing circles persist even in the face of our modern throwaway culture. Within the Greater Seattle chapter are innumerable subgroups, each with its own focus and flavor. Some meet to make items for charities. There’s a fashion-focused couture group. The Bellevue group mostly sews clothing. 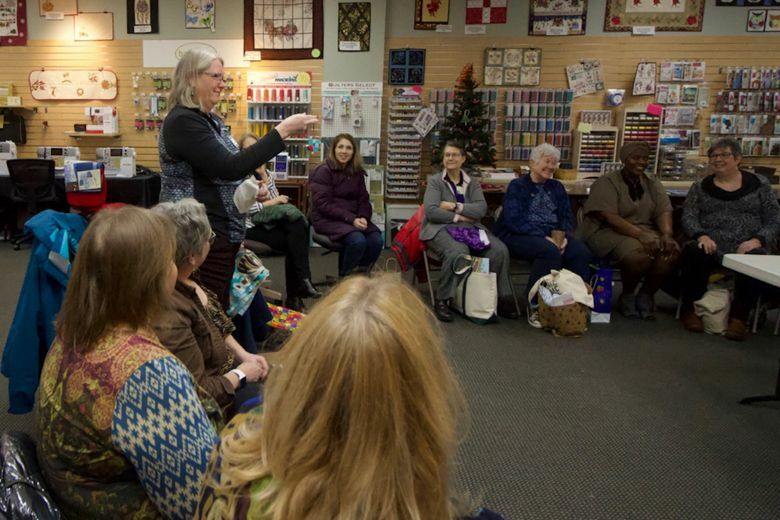 “Sewists” get together to work on projects; take classes; and share stories about battles with imperfect patterns, intransigent fabrics and tricky stitches. But they get far more out of it than sewing tips. At the end of each meeting, individual sewists show off something they’ve made. There’s catwalk-style modeling, closer inspections and jokes about how much swearing any given piece prompted. 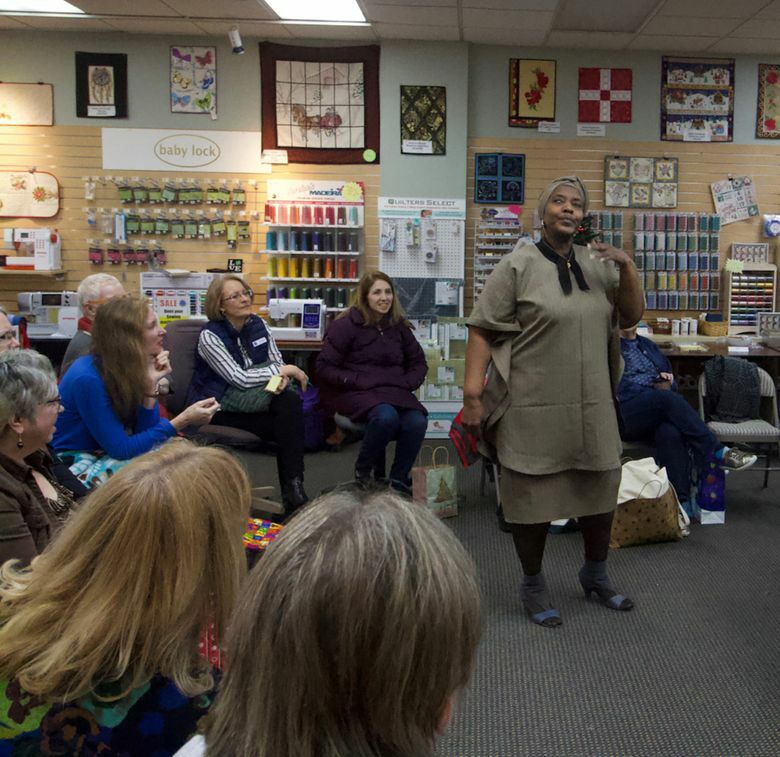 The women — and many who sew are women, but not all — already were planning ahead for the annual Sewing & Stitchery Expo, Feb. 28 to March 3. It’s the nation’s largest sewing convention, held at the Washington State Fairgrounds in Puyallup each year. They’ll attend classes, check out new fabrics and socialize. Anyone can join a sewing group, experienced or not. “Some people, I don’t know if they even sew, but they feel welcome here,” Olsen says.